The Remington RM1015SPS is a reasonably priced but powerful electric pole saw. When compared vs. the RM1015P, there are a few differences. The RM1015SPS updates to an improved trigger and hand guard, and the pole length can be adjusted from either end. The RM1015P’s oiler had a tendency to leak, which appears to have been fixed on this model. Continue reading for a complete review. The electric motor in the RM1015SPS is 8 Amps and puts out 1.5 horsepower. It also has a 10” bar which can cut through tree limbs and trunks as large as 10 inches in diameter. Smaller branches are cut with surprising ease and speed. As one of the most powerful electric pole saws out there, this is a great choice if you’re looking for fast cutting power. Electrics are known for their simple startup and use, and this saw is no different. Weight is average. One small downside to electric pole saws is that a lot of the weight is at the end of the pole, so balancing it does take a bit of getting used to. Other than that, operation is as easy as any electric gardening tool, and it’s no problem to use even for someone who’s never handled a gardening power tool. The saw can also be detached from the end of the pole, which is handy for cutting up branches into smaller pieces. Maintenance and cleanup are easy with the RM1015SPS. Since there are no gas exhaust fumes, sawdust doesn’t easily stick to the saw. To keep this tool in good working order, just wipe down everything but the bar before you put it away, and be sure to check the chain regularly for wear. The saw does have a manual oiler rather than automatic. You’ll need to fill it with 30W motor oil (3 ounces) which is not included. Before you turn the saw on, you’ll press the oiler bulb which will keep the chain from jamming or overheating. If you need to put the saw away for an extended period of time (say, over the winter) you should drain the oil from the reservoir. The length of this pole saw, when fully extended, is 9 feet. This is about average for an electric model, but that’s plenty of length for most uses. You can expect to reach anywhere from 12-14’ off the ground. Inside the box you’ll just find the saw and the manual. You will need to purchase some oil for the bar and chain. Also, corded electric pole saws do not come with a cord – you’ll need an extension cord. A 14 gauge cord is best and will allow you to go up to 100 feet. If you only need 50’ or less of length, 16 gauge is safe to use. The price is quite reasonable on the RM1015SPS, as it is with many electrics. Even though it’s priced close to other brands, I think this saw represents the best value because of its extra cutting power and great reliability. Remington has a 2-year parts and labor warranty on this saw, which is typical of any brand of pole saw. If you need replacement parts, you can check out PartsFor.com. Amazon.com also offers replacement chains. With an electric, the chain is really all you should need to replace unless the saw is dropped or otherwise damaged. The RM1015SPS hits all the important marks – powerful, easy to use, reliable, and affordable. Improvements were made over the already great RM1015P model as noted in the beginning of this review. The Remington RM1015SPS is my top pick of all electric pole saws. The Remington RM0612P is a very lightweight, affordable pole saw. Can it measure up to its more powerful competitors? Read on for the full review. At 6 Amps, this saw is on the low end of the power scale, and isn’t able to tackle as thick of tree limbs as some other models. Expect to be able to cut branches 6 inches in diameter, but no thicker. This saw is pretty simple to operate. It has the advantage of being the lightest electric saw out there at only 6.5 pounds. This makes it much easier to maneuver and less strenuous to hold for a long period of time than a lot of other saws. The saw doesn’t include an automatic oiler – you will have to keep a bottle of bar & chain oil handy and manually apply oil before each use. While the build quality of other Remington saws is excellent, I feel the RM0612P falls short. Granted, it’s less expensive, but it doesn’t live up to the brand’s reputation. The drive gears are made of plastic and are prone to failure which is a big drawback for this model. The maximum extension for this saw is on the low end at 7 feet, while most electrics reach 9 feet on average. This is the tradeoff you get for such a lightweight saw. Inside the box you’ll find the saw and instruction manual. As is typical, bar and chain oil and an extension cord are not included, but are necessary to get started. If you’re shopping on price alone, the RM0612 has all of the others beat. It can be found under $80, which is at least $10 less than other models. I do feel some corners were cut to reach this price point, however; namely, the maximum reach and build quality. This saw is covered by a 2 year parts and labor warranty. This is an average warranty duration for the industry. Remington RM0612P replacement parts are not available, other than the chain. Expect the entire saw to be replaced if it fails within the warranty period. Past the warranty period, it unfortunately will not be possible to obtain a replacement. While I appreciate that Remington offers a model of pole saw under $80, the quality of the RM0612P just doesn’t match their other saws. Fortunately, electrics are priced reasonably in general, so you don’t need to spend a lot more to get a durable and powerful saw. My recommendation is to skip the RM0612P and spend the extra $30 or so to move up to the Remington RM1015sPS. It’s very reliable, more powerful, and reaches an extra 2 feet. The Remington RM1015P is an affordable yet capable electric pole saw. Read on for a full review of this saw. The RM1015P has an 8-Amp electric motor which puts out 1.5 horsepower. This makes it one of the most powerful electrics available. 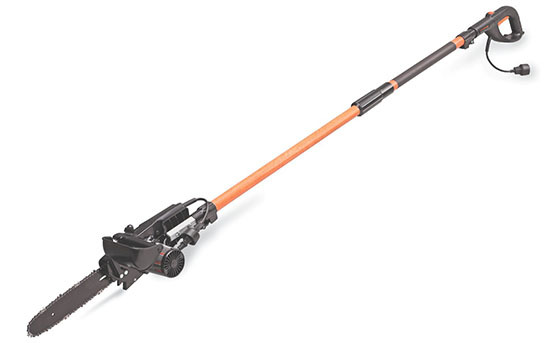 Its 10” bar is rated to cut through tree limbs up to 10 inches wide, and will do so with ease. If the trees you need to prune have thick branches and you’re looking to go with an electric, this saw is one of the best choices out there. This model is very easy to clean and maintain. As an electric, sawdust doesn’t cling to it since there are no gas exhaust fumes. Just wipe it down after using it and be sure to keep the chain tightened. The manual oiler needs to be filled with 3 ounces of 30W motor oil (not included) and pumped by pressing the bulb before making cuts. It’s recommended to drain the oil when you store the saw, which I think is particularly important with this model since it tends to leak oil from the reservoir. In terms of reliability, this saw holds up surprisingly well – better than you might expect for its price. I would consider Remington the top brand for reliability in an electric. As an electric pole saw, this saw is less intimidating to use than a gas saw. Just check it over, plug it in, and start it up. In terms of handling, the weight of the RM1015P is average for an electric at 11.2 pounds. Like other electrics, most of the weight is in the saw itself which is of course at the end of the pole. This can make it a bit tiring to hold when it’s fully extended. Again, that’s typical for an electric. The saw does detach from the pole on this model, so you can remove it and use it to cut branches into smaller chunks. Fully extended, this pole saw measures 9 feet in length. This means you can expect to reach branches at least 12’ up. In the package, all you’ll find is the saw, pole, and user guide. Be sure to pick up a bottle of bar and chain oil or 30W motor oil for the oiler as you’ll need it to get started. You’ll also need a standard extension cord. You can go up to 100’ in length if you use at least a 14 gauge cord; use at least a 16 gauge cord for 50’ or less. Like other electrics, this saw is priced reasonably at just over $100. Don’t let that put you off, though – the RM1015P is a great buy. There are other saws out there in the $80 range, but they don’t have the power or the 10” bar for cutting larger limbs. I’d spend the small amount extra for this saw’s capabilities. This saw has a 2 year parts and labor warranty, which is considered the industry standard. Remington pole saw parts are available online from PartsFor.com. You can also buy replacement chains from Amazon at a reasonable price. The Remington RM1015P is a great choice in an electric pole saw. It’s easy to use, powerful, reliable, and surprisingly affordable. It’s been updated with the RM1015SPS model, which seems to have resolved the issue with the leaky oiler. However, the RM1015P can be found at a lower price, so take that into consideration.